“I’m very happy about how he trained today. I usually tell my rider to warm him up a little bit before – this time we went going opposite (right-handed), just going a couple of hundred yards – and he went from a light training to a little more faster on the end (lelft-handed); quarter of a mile jogging and then a mile and a half gallop to my eyes. “We did a little checking yesterday to feel the difference of the track, but today he was just perfect. He kept his weight on (upon arrival in Japan), and he hasn’t lost any appetite which is a sign of a horse that’s a great traveler and knows what to do. “The decision to come to the Champions Cup was made early before the Breeders’ Cup but not 100 percent because we always have to check the horse and make sure he’s healthy right off a tough race. The very next day (after the BC) we found immediately that the horse was nice, not tired and in good health condition so the owner and the connections of our stable decided to accept the invitation from this great country which we were here a couple of times before, and we’re very happy to be here. “I had a little tough impression about the sand track when we came to the Tokyo race (Japan Cup Dirt) and that it was a little bit hard on the American horses. So, I asked the people to take me here to check the soil on the track and I was surprised to find that it was completely soft and different – I’m very happy with the track – it’s pure sand, unlike many tracks in the US which is clay mixed with sand, but Pavel has raced in Kentucky where it is three quarters sand and a quarter of dirt, so if he likes Kentucky we’re going to have a very good race with him here. “The distance shouldn’t be an issue with the way he runs on the stretch – he’s run in New York where the stretch is also long, and Kentucky is as long as the stretch here. (Jockey) Mario (Gutierrez) is going to ride two horses here before our race, so he can get to know the track a little better and know when to make a move with Pavel. He’s a strong horse and once his position moves up he has the strength to stay there and strong enough to finish the race like that, so as long as he can find a good spot in a 16-horse field and not get trapped he should race well and we’ve traveled all this way to win, of course, but I would be happy as long as he can race smoothly and finish third or fourth. “He felt really good today. He already knows this kind of track since he’s been working on dirt in the quarantine facility and I can tell he feels no difference going on the track here (at Chukyo). 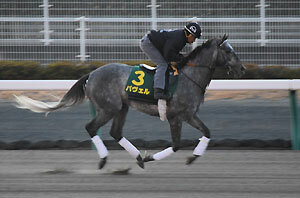 “When you get in the track you can tell right away if the horse likes the surface or not – even in America every track is different – when he came to the training center (Shiroi) he took to the sand track right away and then from there to here, he felt the same quality of the track and he was very happy about it, and I can tell he likes it a lot. “He misses all the horses because when he sees all the horses around him he can get really excited, especially the BC where there’s a bunch of horses coming out at the same time, so that’s probably the biggest difference in him compared to the norm.